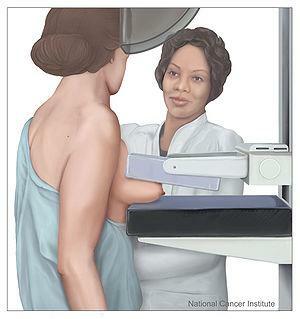 Women undergo mammography imaging due for preventive purposes, during a regular breast checkup. However, this screening can be done once a physical exam carried out by the doctor reveals abnormal lumps or some other unexpected anomalies in the breast tissue. Even though mammography is one of the best ways of diagnosing breast cancer at an early stage, it is a procedure which lacks specificity. Surely, its sensitivity is high, being about 88% for detectable forms of cancer. Here, the physical exam compensates for the remaining 12%. However, the specificity remains lower than 35% and many women end up undergoing biopsy for no malignant reasons. On the other hand positron emission mammography increases the specificity of this procedure, by focusing on the exact forms of tissue which are more likely to be cancerous. The difference between a regular mammography and the PEM lies in the fact that the latter involves injecting a positron emitting radionuclide, labeled to the molecule of interest. So, these molecules tag or mark the suspicious tissue, allowing hot spot images to be created later, helping the medical staff know exactly which parts of the tissue might be cancer-related. The signals emitted by during the PEM are detected by positron emission topography device or the PET scanner, showing potential cancer spots as brighter than the rest of the tissue. At first this form of cancer screening faced many negative characteristics, due to the expensive equipment, lack of certain qualities and some limitations. However, today whole body PET scans do not have to be purchased to be used for the breast area only, since there are smaller, cheaper and more localized variants. Moreover, some new forms of these devices are constantly being discovered and improved, allowing people to benefit from them even more. The newest form of mammography technology involves a dual-detector system mounted on two compression paddles which are used to press the breast tissue in order to create a sharper and more precise image of the tissue. Moreover, these paddles can be rotated, creating images from different angles, increasing chances of detection. Additionally, when this technology first came out, in 2005 a study was carried out, encompassing 44 women with confirmed breast cancers. Here, the PEM, using 10mm crystals detected 39 out of the 44 tumors. Also, the PEM predicted the positive or negative outcomes in patients who were undergoing breast-conserving surgeries. Another study was carried out in 2006 in order to show the potentials of PEM in breast cancer imaging. Here in patients who were not suffering from diabetes, the PEM was capable of detecting cancer in 91% of cases, with a specificity of 93% and an accuracy of 92%. Therefore, this form of mammography is considered to be the most precise one, detecting many different forms of breast cancer and differentiating them from other forms of benign abnormal tissue. Nevertheless, more studies are being carried out, where scientists are giving their best to discover ways of improving the PEM devices. New molecular imaging agents are being discovered for the PEM, making it even better and more capable of detecting even larger varieties of cancers, including the breast cancer with all of its diversities. The new molecular imaging agents will be capable of detecting a specific type of tumor, allowing the health experts to plan out a more direct way of dealing with this condition, through a well-developed cancer therapy. The best fact about these forms of development is that the current PEM technology will have no compatibility problems with them, advancing without actually changing. However, the whole process of development of the positron emission mammography is still in its early stages. Regardless, we can see a future of highly personalized and effective cancer therapy stemming from the progresses made in the present. Speaking of advancements on the field of PEM, yet another study which was carried out investigating the dual-time-point PEM imaging in 11 patients, revealed that comparing delayed images increased the chances of differentiating benign lesions from malign ones. However, this is only a hypothesis and more research is needed to be done in order to truly confirm this. Nonetheless, the potentials of PEM grow with every discovery of these types. All in all, the positron emission mammography is a form of mammography which uses intravenous, injectable FDG, being a molecule resembling sugar, accumulating in the glucose-prone cells. Since cancer cells grow faster, their need for glucose increases and they attract these molecules, revealing themselves during the PEM. Surely, this form of mammography has its positive and negative sides, but, nevertheless, it is the most precise tool for a timely diagnosis of breast cancer. Its specificity is much higher that that of the regular mammography, due to its capability do detect many different forms of potential cancer tissue.